on all sides with a few remaining Merferds. 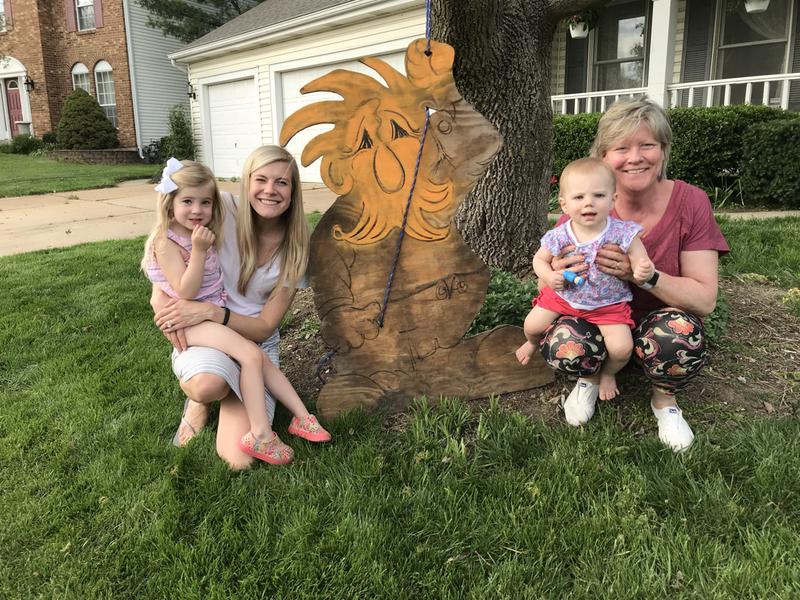 North St Louis lumber, who donates Merferd making wood, also donated the lumber for the building of the teensy house for Bebe'. asked him, because he had an uncanny ability to roast me. 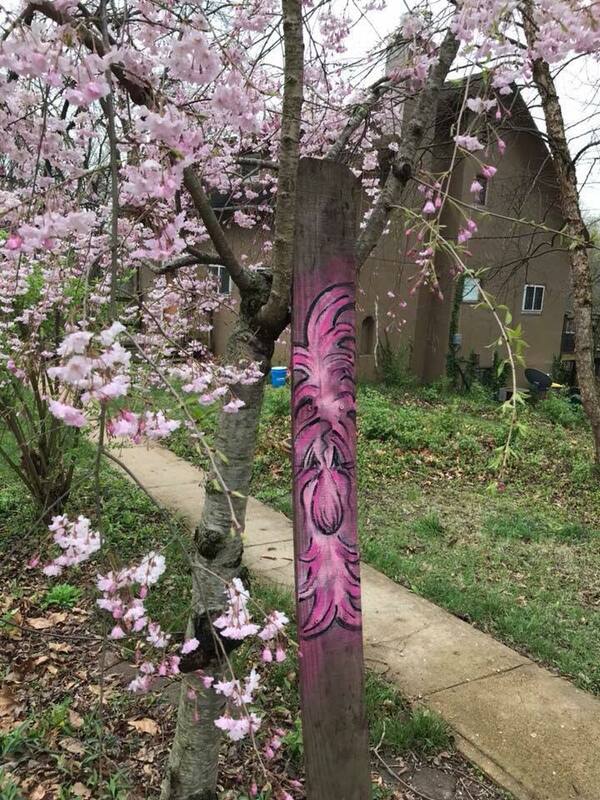 woods in East St Louis. with his warm red tent. the camp. His cozy, tent was home sweet home to him. On the wall in the background a certificate of his baptism.​Channel Four's Ray Preston and his Camera man Steve interviewed Rob the next morning. The next thing I knew they were over by our truck. Rob asked them if they ever had heard about the Man behind the Merferds. 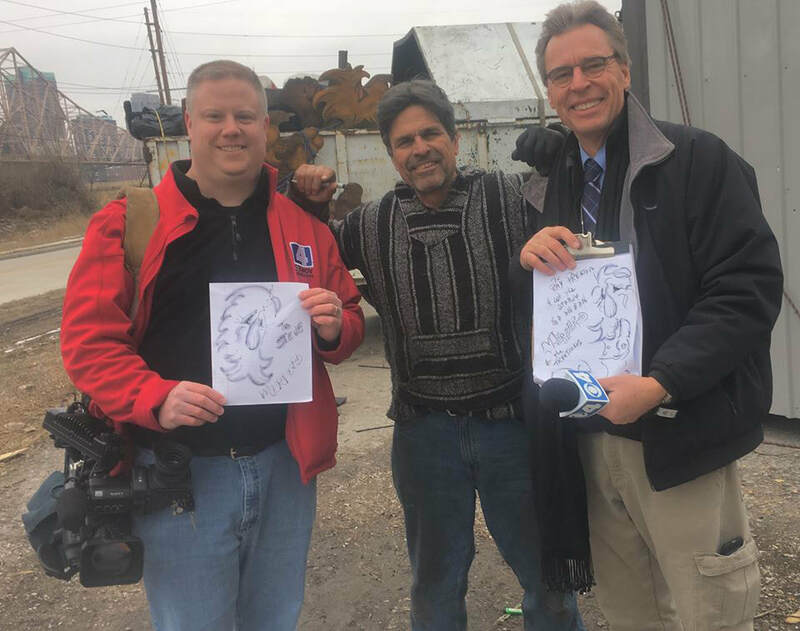 Ray had been wanting to interview me some day and do a story. 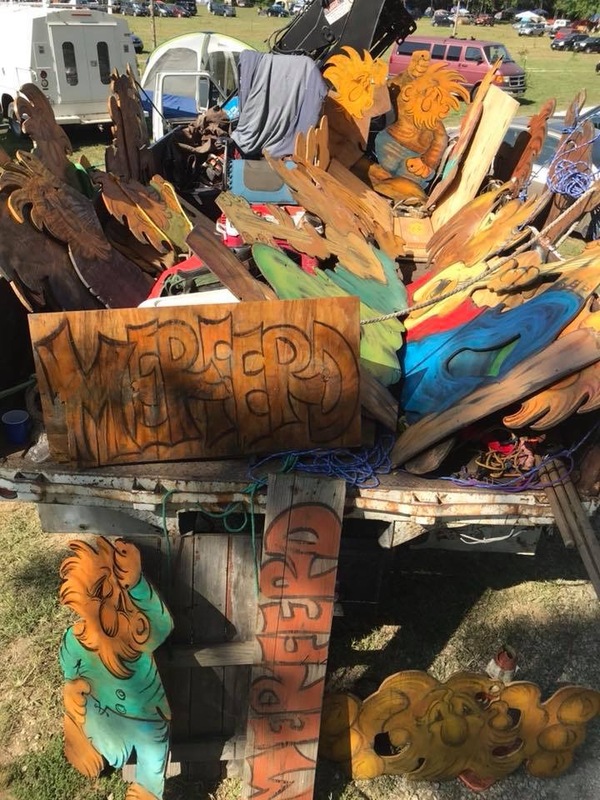 MERF MASS TREES AVAILABLE NOW! 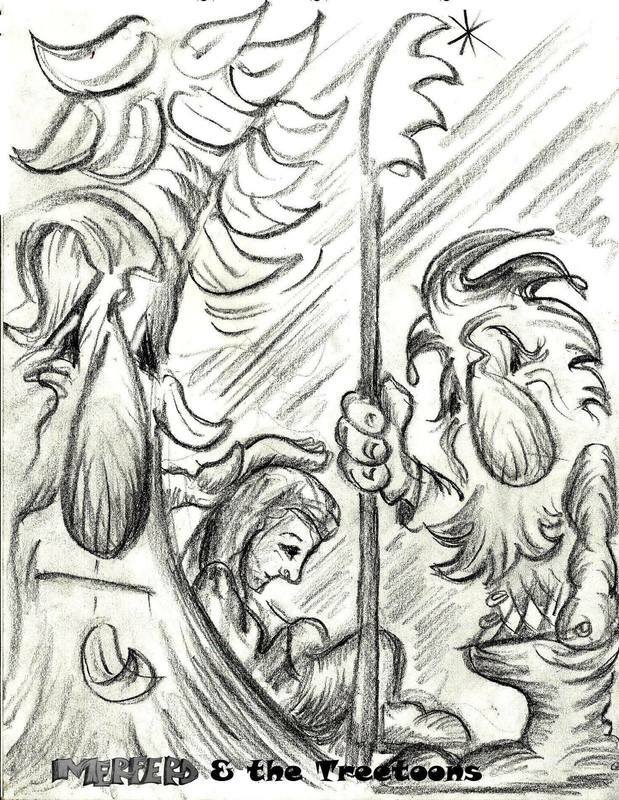 Phil personally creates each unique Merferd climbing up to the star. Merferd can be easily removed from the star and placed on a larger Christmas tree as an ornament if so desired. Pictured left to right, Christopher, my apprentice, (when not in school), Bebe’, pallett tree, star maker, and tree care helper and myself.. 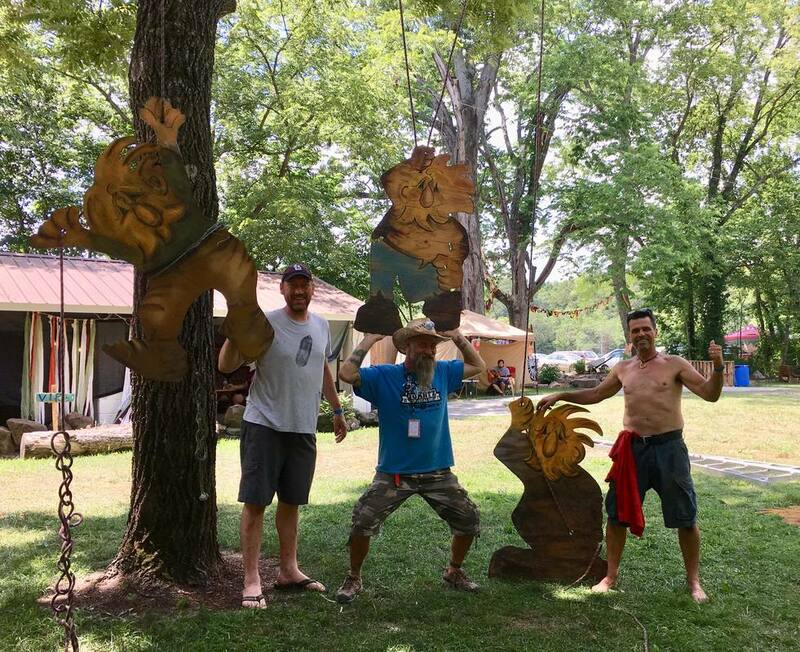 The photo is taken at “Treetoon Town”, part homeless camp. We are grateful to Riverside Antiques, who is not charging a consignment fee. We are also thankful that the mayor in East St Louis does not give orders to bulldozer camps to make the homeless go away, as in St Louis. 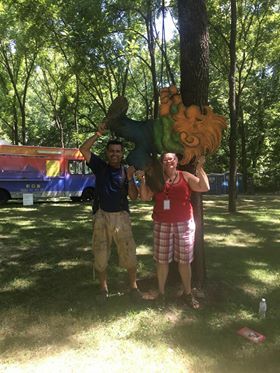 Tree jobs at never complete without a Treetoon hangin' around with us. 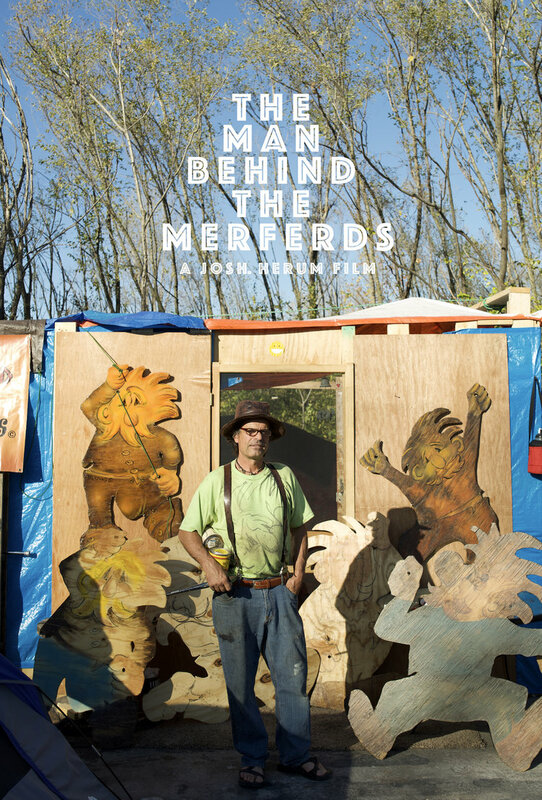 Josh Herum and Phil are pleased to announce that Josh's film “The Man Behind the Merferds” is screening with Paul Crane’s “Living in Tents” this Sunday, November 4th at 1:00 pm at the Zack theater at the St Louis International Film Festival. 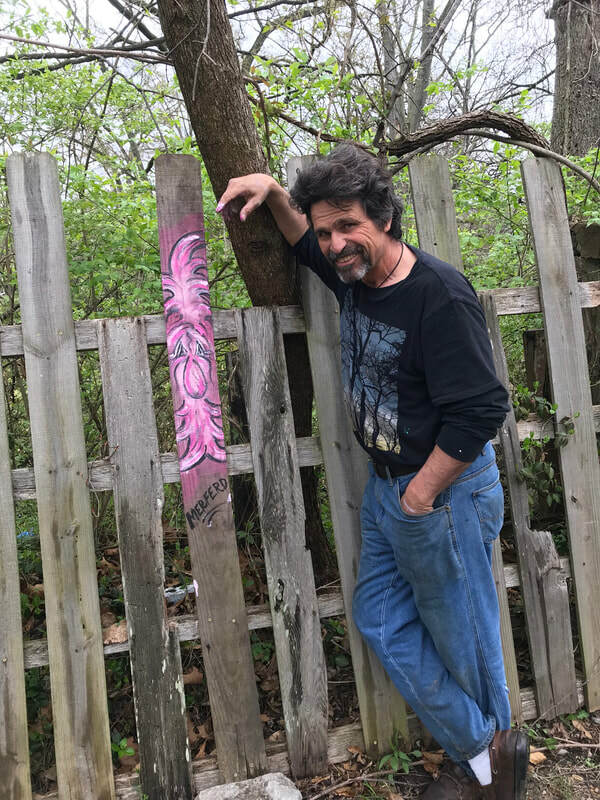 How cool, that, (Sunday, Nov 4, 1:00 at the Zack theater,) out of the multitude of entries, for Josh Herum and I to be teamed up with "Living in Tents". 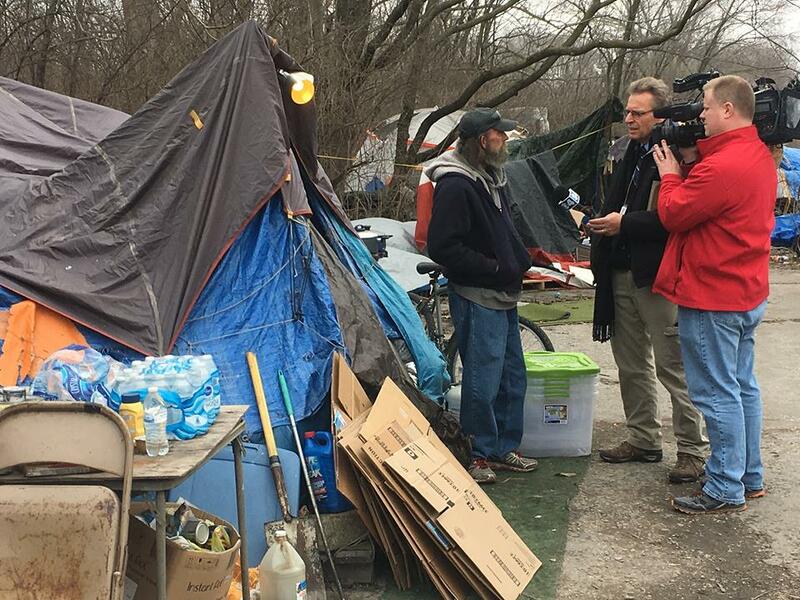 I'm still so disappointed with mayors Krewson and Slay, having shut down our city's only 24 emergency homeless shelter, at the behest of a large political donor. 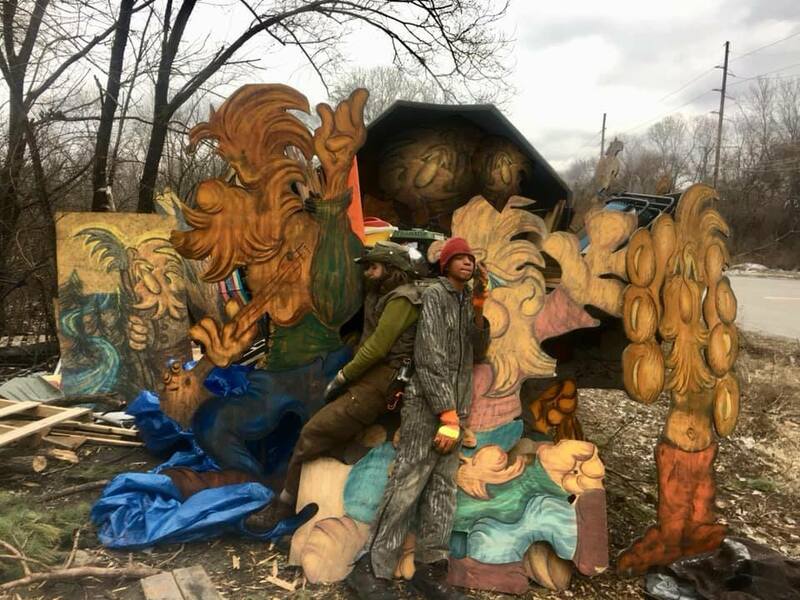 Merferd art continues at a homeless camp, across the river, where the East St Louis' mayor visits. She has even cut the grass. On the St Louis side, the mayors send the bulldozers. Instead of the Forestry division saving trees, they are ordered to dismantle tents, and even cut down the trees that shade them. 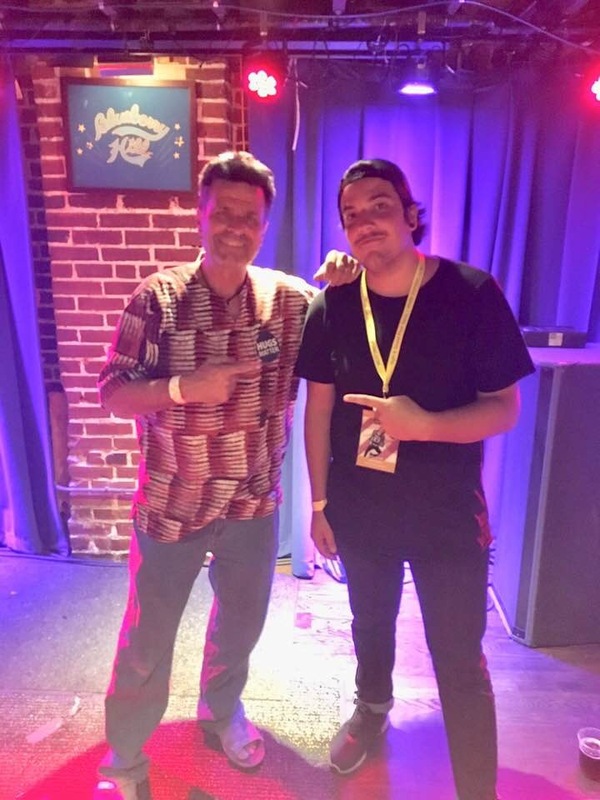 Phil and Josh Heru, are both LIT UP that Josh’s film made it into the St Louis International Film Fest, which will have entries from around the world. 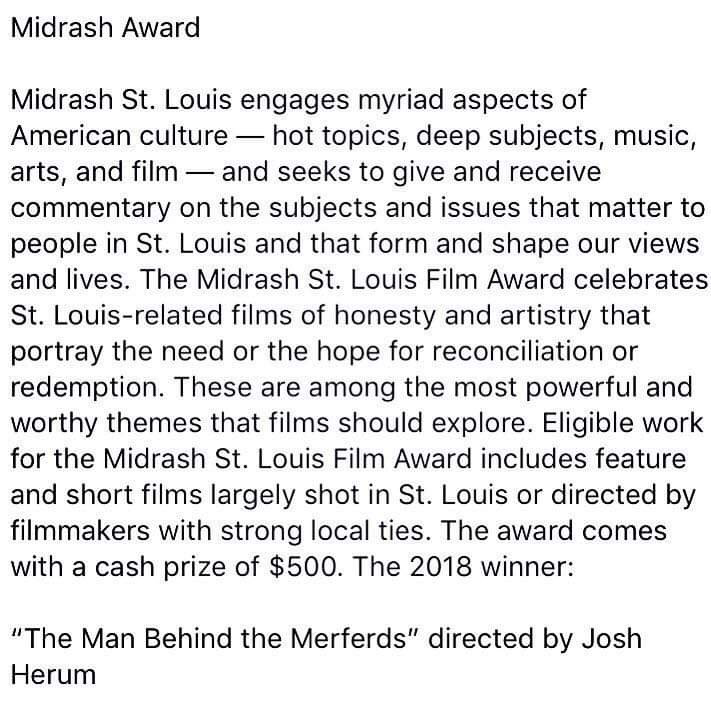 Thank you to the St Louis film fest and Doc Shorts folks at Wash U for the platform that for 17 years has encouraged the great film-making talent in St Louis world. ​See the lineup and buy tickets here. 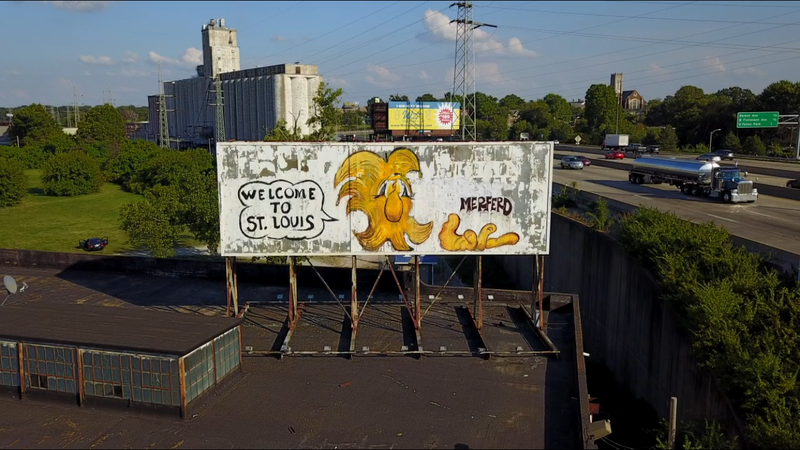 Phil Berwick, a street artist in St. Louis, uses his paintings of Merferd — a bearded character he has been drawing for four decades — to carry a message of peace, hope, and love to some of the darkest areas of the city. The 27th Annual Whitaker St. Louis International Film Festival provides St. Louis filmgoers with the finest in world cinema — international films, documentaries, American indies, and shorts that can only be seen on the big screen at the festival. Phil needed a road crew! 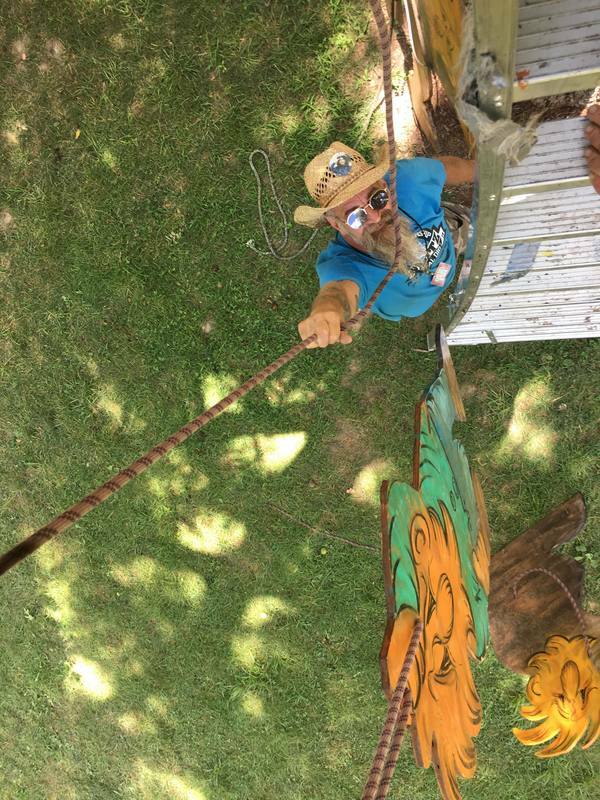 ​After having spent a long day preparing for the “Pickin on Picknic” fest in St Clair, Phil and Merferd arrived and slept in the bed of Phil's tree crane truck on a comfortable kick back lawn chair. The next day Phil was somewhat overwhelmed. 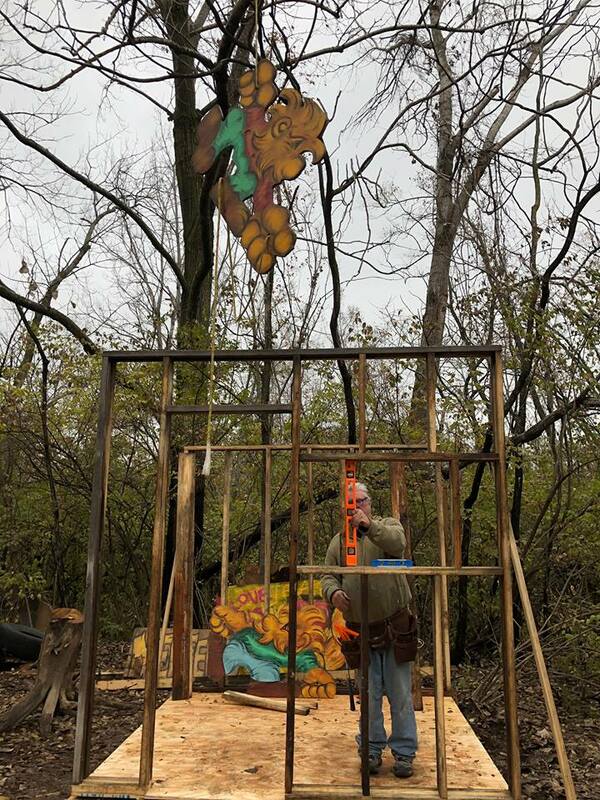 He wondered "if it took so long to prepare and pull the Merferds out of their St Louis trees, how was I going to think I was going to be able to reinstall at the festival by dark?! It dawned on me that I needed a ROAD CREW." 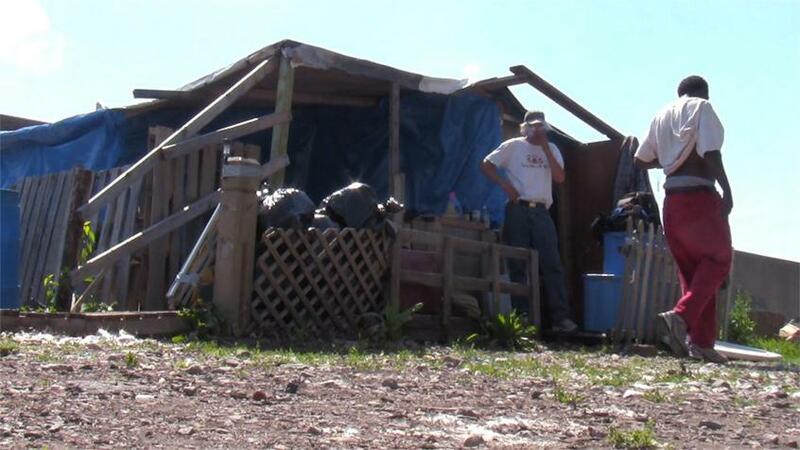 ​Help began to come with Tim, who owns his own tricycle people riding company in St Louis. He’d given me a ride once and I tipped him well, and it all comes back! I handed him 20 Merferds and shanks of rope that he helped me deliver to 20 trees! When Tim stuck his head above that tailgate and asked if he could help if I hadn’t had a ride on his tricycle I would have thunk him an angel sent by God! ​And as I began attempting to do a triple Merferd installation a man appears, digging the Merferds. 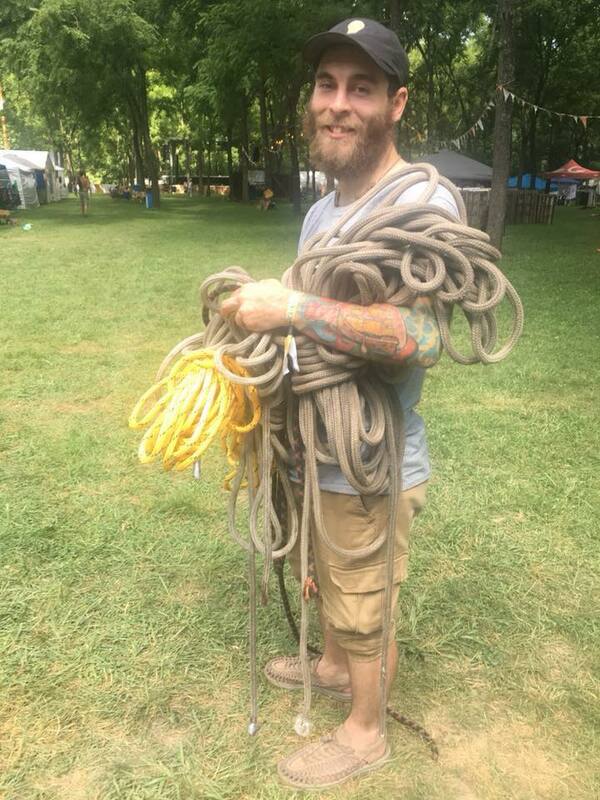 He tells me he loves to rig with trees. And who was he, other than a man named PIGLET who was the owner of the SHANTI in St Louis where I had performed once or twice! “Big Mike” joins me and Piglet, and the Merferds are in the buddy rigging system now! ​I even had help from Laurell Lee! There were other helpers too - the lady in the straw hat who saw me straining, the man who brought me his chair to stand on ... wish I had photos of them all." 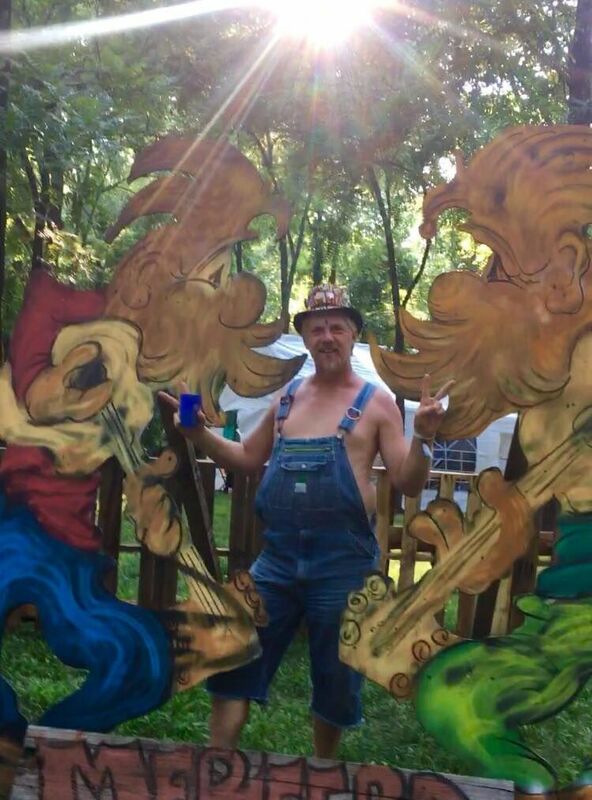 Marvin Rudolph jammin' with the Musical Merferds. ... then Phil went off to ride on a bicycle and listen to the music of The Mighty Pines. 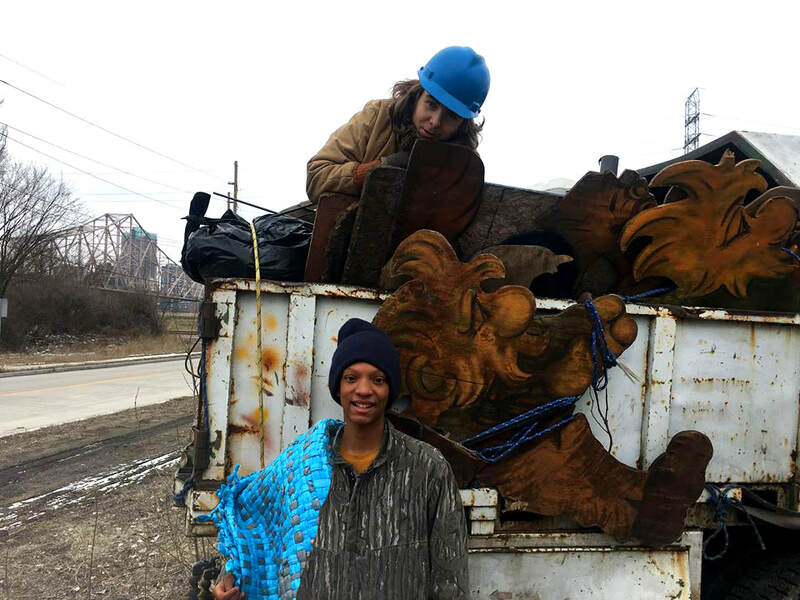 Merferd and the Treetoons in "Picking Up the Trash"
This video is in honor of a homeless friend, BeBe McBride, who has a street cleaning team in St Louis. BeBe is also on my tree care crew. 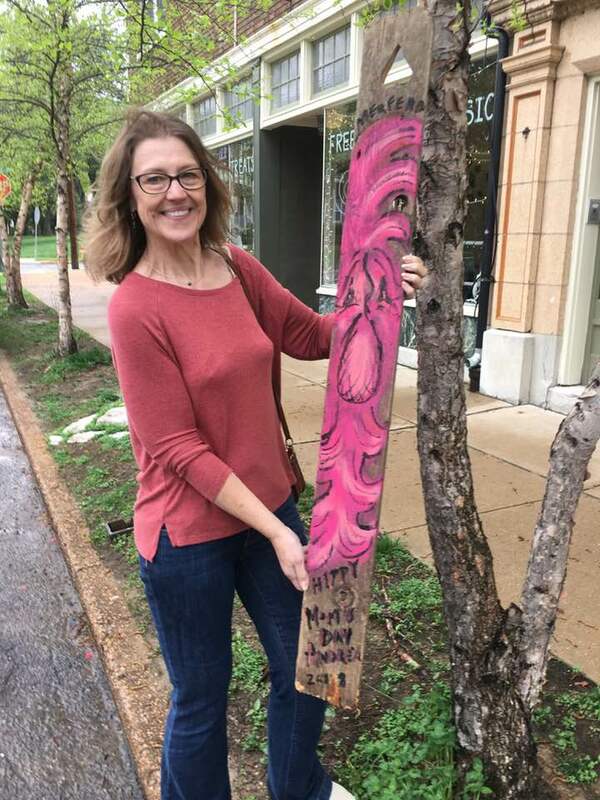 The city of St Louis... certain ivory tower 'rulers' don't have as much creative thought of how to enable the homeless to work, but are thinking instead all the time of how to make them go away. They order the Forestry dept out o bull doze down their tents and their trees. This is the year that you surprise your Mom with a unique and thoughtful gift. Proceeds help to bring more smiling Merferds to our town. It's a win-win! 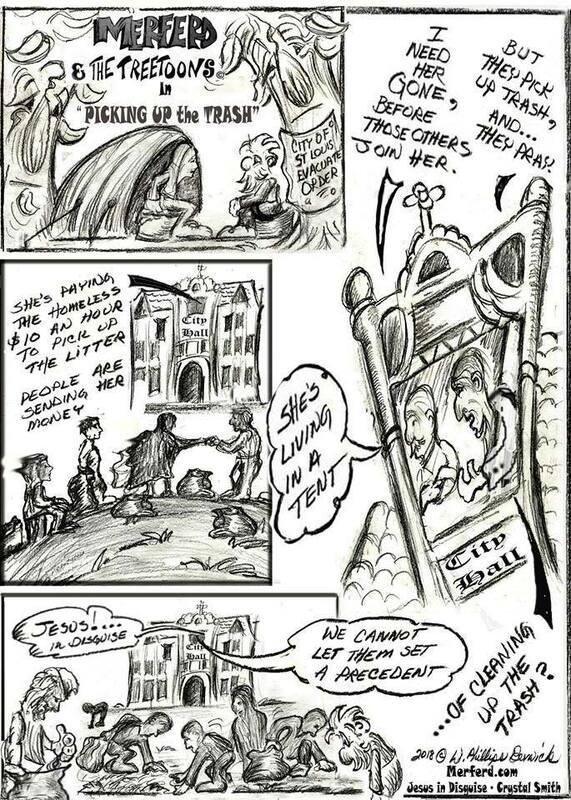 Fathers' Day Merferd - Hand Drawn! 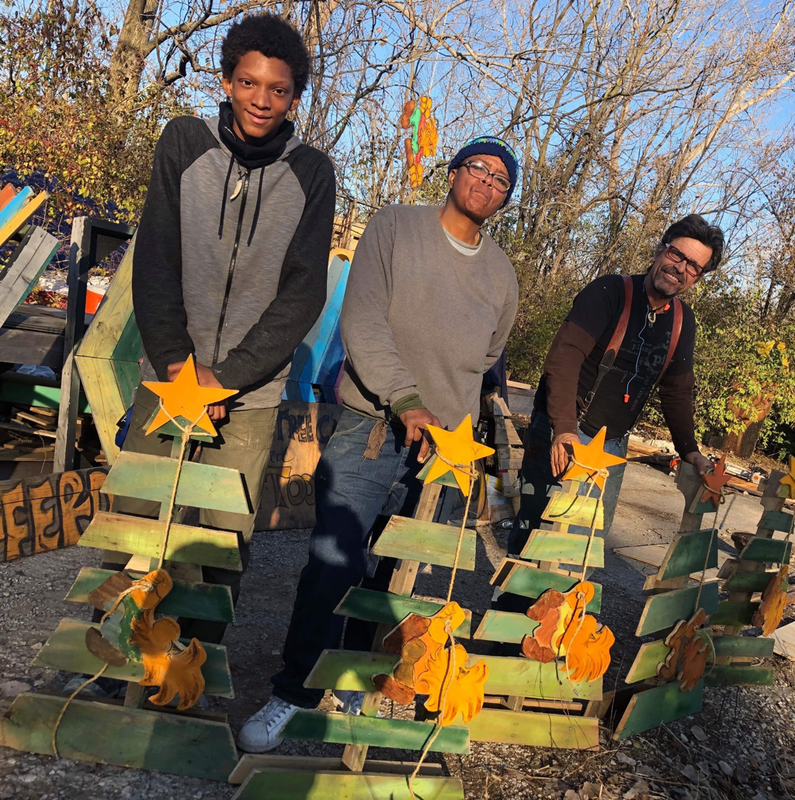 Unsung hero friends started an amazing thing this year in the city of St Louis when they began putting un-housed friends to work cleaning up the trash in the city. ​Those whose heads hung low, are proudly being empowered. Where once litter was filling every square foot of the North center of the City, clean green grass and sidewalks shine forth. The City had long abandoned the area and its people, until recently. 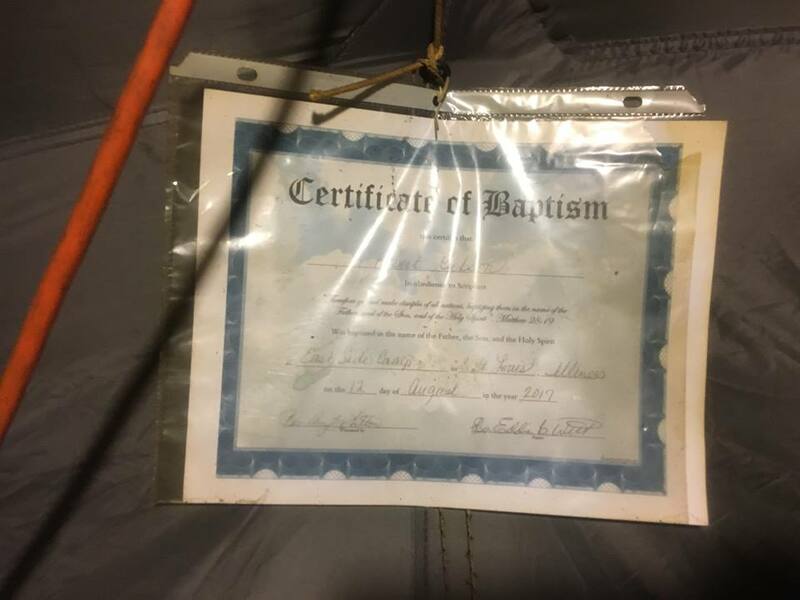 After learning of the movement, one of the participants was forced to pack up her tent and the supplies that she dispersed to the homeless and leave.